"The Department of Veterans Affairs reported that 55% of the 22.7 million veterans in the U.S are age 60 and older. There are several benefits available and more applicable to these senior veterans and their spouses". Are you in need of continuing legal education (CLE) to maintain your VA Accreditation as an attorney or agent with the Department of Veterans Affairs (DVA)? We offer 3 hour self-study video courses (approved by VA's Office of General Counsel) that will meet your initial first year CLE requirements or any ongoing 3 hours of CLE on veterans benefits law and procedures required every two years (see 38 C.F.R. § 14.629). The National Care Planning provides study materials, sample questions with answers, and "1 On 1" phone coaching to help individuals and non-practicing attorneys prepare for and pass the exam with VA to become Accredited VA Claims Agents. Individuals who are not accredited (see 38 USC§ 5901) may not assist in the preparation, presentation and prosecution of an initial claim for VA benefits. The only exception to this rule is that any person may help any veteran -- one-time only -- with a claim (38 CFR§ 14.630 & 38 USC§ 5903). This book (2019 Edition) is a welcome and much needed resource for veterans, their survivors, and for those who assist veterans. 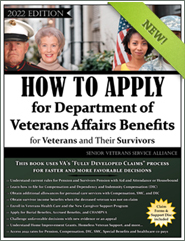 This book provides current information on VA Rules and detailed instructions on how to submit "Fully Developed Claims." This edition of the "How to Apply Book" is the most important revision made since 2014. All previous year's additions are now out of date. Claim Support Data Disc Included! Disc - Intake Center Mailing/Faxing Information, 240 + Current VA forms, 2019 Benefit Rates, Detailed Checklists (instructions for each type of claim), Medical Examination Worksheets, Medical Questionnaires, and the Federal Register release regarding VA's New Rules Changes for Pension.